Those with vision problems can easily change the font size for SAP User Interface. Increased font size will reduce stress on your eyes and lead to a better day at the office. This article will discuss how to increase font size in SAP. Screenshots appear below these instructions. From the main SAP User Interface, click on the Customize Local Layout Icon or press ALT + F12. Expand Visual Design by clicking on the arrow next to it. 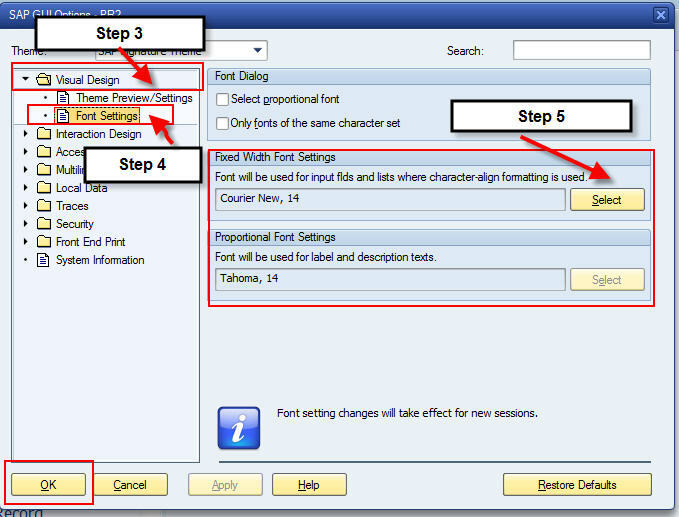 Select the desired Font and Font size and click OK.
Exit SAP and login again. As per a research conducted by the Eye Magazine, reading text with small font size can cause eye strains. However, you don’t want the font to be too big either. So, choose a comfortable size which is easy to read. In addition to font size, consider the following best practices for reducing strain on your eyes. Avoid going too close to the screen. Eliminate any bright lighting behind your head while reading. Consider adjusting the brightness and contrast of your screen to a setting which is comfortable for your eyes. Try to look away from the screen frequently to give your eyes a break.